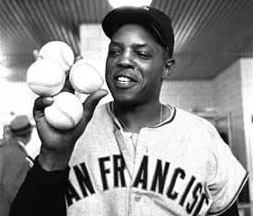 Baseball history is filled with the storied achievements by long ball legends, including Willie Mays, Hank Aaron and Babe Ruth, who were able to hit long-balls seemingly at will. And when the greatest hitters in baseball got in the groove, they really put on a show! Willie Mays who hit 660 career long balls and his fellow 500 Home Run Club member Mike Schmidt two of only 15 players to hit four home runs in a single contest. “Say Hey” Willie achieved this super-human feat with flair and fanfare on April 30, 1961, while leading the San Francisco Giants to a 14-4 victory over the Milwaukee Braves. After crushing his Major League Baseball tying best fourth homer run, he said: “After you get two in a game, you don't start looking for a third one, but they just kept coming," He said. “This was my best game and it was my biggest thrill in baseball too…No, my best game wasn't one of those catches I made in the World Series because I don't count fielding. That's always been easy for me." 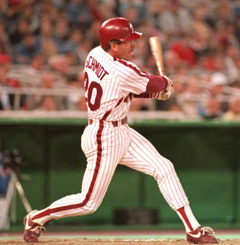 While Mike Schmidt matched him by going yard four times on April 17, 1976 to give his Phillies team an 18-16 victory over the Chicago Cubs. “Some days you just see the ball and it jumps off your bat,” Schmidt was quoted as saying after the game. “I just wanted us to win the game…that’s all that matters to me." Eleven 500 HRC members (IN BOLDFACE BELOW) are among only 60 players in MLB history to TWICE hit three home runs in a single game: Harold Baines, Jeff Bagwell, Ernie Banks, Johnny Bench, Geronimo Berroa, Albert Belle, Bret Boone, George Brett, Gary Carter, Joe Carter, Roberto Clemente, Rocky Colavito, José Canseco, Eric Davis, Glenn Davis, André Dawson, Doug DeCinces, Carlos Delgado, Joe DiMaggio, Don Demeter, Cecil Fielder, Steve Finley, Jimmie Foxx, Nomar Garciaparra, Lou Gerhrig, Juan González, Goose Goslin, Frank Higgins, Bobby Higginson, Willie Horton, Reggie Jackson, George Kelly, Ralph Kiner, Dave Kingman, Tony Lazzeri, Edgar Martinez, John Mayberry, Willie Mays,Willie McCovey, Mark McGwire, Johnny Mize, Eddie Murray, Ben Ogilvie, Larry Parrish, Boog Powell, Manny Ramirez, Dusty Rhodes, Jim Rice, Alex Rodriguez,Babe Ruth, Hank Sauer, Mike Schmidt, Duke Snider, Sammy Sosa, Miguel Tejada,Jim Thome, Willie Stargell, Mo Vaughn, Larry Walker, Ted Williams. "Some of the longest home runs I've hit, I didn't actually realize they were going that far. Everyone says, 'What does it feel like to hit the ball that far?' Actually, there's no feeling at all. I know when the ball meets the bat whether or not it's left the park. It's a nice easy thing." Mark McGwire.